The Cuisinart CEK-40 electric knife not only delivers high performance and great satisfaction, but is also a countertop space saver. Complete with two stainless steel blades, it is ideal for slicing meats, loaves, and vegetables. The CEK-40 includes an ergonomic handle that's designed for right- or left-handed people, and a solid wood butcher-block storage tray with safety lock system for storage in a drawer or on the counter. The Electric Carving Knife has many exciting features for users of all types. You can extend the lifetime of your Electric Carving Knife with the purchase of a FactoryOutletStore Factory Protection Plan. 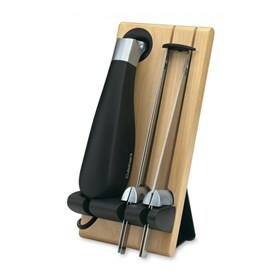 See the Electric Carving Knife gallery images above for more product views. The Electric Carving Knife is sold as a Brand New Unopened Item.